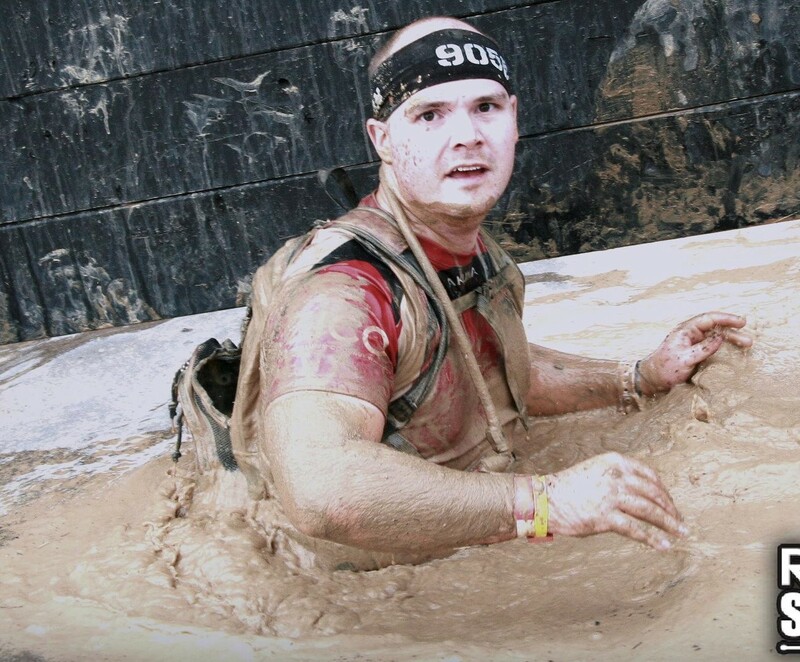 This was my third Tough Mudder. While I was disappointed with the first, they more than made up for it on the second, and I was excited to see what they would put me through this year. Note: If I felt a particular obstacle needed a picture and I couldn’t find one of me, I stole a photo from TM’s Facebook page that I felt duplicated my experience. We assembled in the warm-up area, the MC put us through some calisthenics, and we took off, thinking that TM had dropped the usual practice of making you go over a wall to get to the starting line. Nope, they just moved the wall a bit further out. As usual, we got an awesome pep talk from the MC, followed by a speech from an officer of the local Army Reserve. He told us that one of the people that inspires him would be on the course somewhere after the mud crawl, one of his sargents who had lost most of his hand but still found ways to adapt and do his duties. We were encouraged to give him a muddy hug when we found him. We were then sent off, high-fiving the troops as we went. First obstacle was the Kiss of Mud, a low crawl under barbed wire through some seriously sloppy mud. Next were the Berlin Walls. I helped others over and made it over the first one unassisted (using the edge of the wall and diagonal supports) and gave and got some assistance over the second. Shortly after we came across a group of soldiers. When I got to the Electric Eel, a woman out in the middle was freaking out, screaming, ignoring any calls of encouragement or advice on how to get through it, to the point that the volunteers killed the electricity to get her out. While I will do electrified obstacles without complaint, I’m not waiting around for them, so I went through while the power was off. I left the tube and hit the water desperately trying to turn face-down so I can clear my nostrils and dog-paddle. I felt my hands touch the bottom of the pit, swam out, and was lucky enough to have someone find my headband and get it back to me. Mud Mile next, teamless teamwork, push the guy in front of you and pull up the one behind, get out of the mud pit then go into the next one. I don’t think I saw anyone accept the help up and then go on, they all turned back to help the rest. Next obstacle was the peg-board climb, with newbie and Legionnaire options. I tried and failed the hard one, then went back and completed the easier one. Arctic Enema has changed. You now slide in on a steep slope, under chain-link fence, making it impossible to stand up and steady yourself before you have to go under the water. Seemingly minor change that made it a lot tougher for me. The log carry was when I could feel my training pay off. It is always a good feeling when you hand off the log you carried (solo) to a team rather than an individual. It seemed light compared to sandbag work that I’ve been doing. Sprint for all I’m worth, make it to their hands, and between the three of us we are able to get me over. There was a sign calling for all Legionnaires to help at least three newbies before moving on. I made it a point to make that 4 or 5. Particular phrases or images often stick in your head from events, that just seem to sum up the experience. “Send it” just seemed to crystallize what we were all doing out here. You know what you need to do, we’ve got your back, let’s do this. The next was possibly the most fun obstacle I have ever experienced, called the Block Ness Monster, a floating block that would turn toward you if you tried to climb on top of it, and had to be turned by your fellow Mudders on either side while you are rotated over the top. Hero carry next. I was odd man out when I arrived, so one of the volunteers graciously stepped in. Pyramid Scheme is one of the most teamwork-reliant obstacles I have ever come across. Take Spartan’s slick wall, make it about a third again taller, out of a slicker sheathing, and take away the ropes. We built human ladders, human chains, pushed, pulled till we found a way to get up and over. I took off my pack to give me a little better reach, and found that having something for both of us to grip on made pulling them up much easier. Birth Canal is a low crawl under tarps weighted down with water. I took the lane closer to the supports, which made it a little easier. Next was a tall reverse wall. The easiest way we found to do this was to have two on top each take a hand of the person below, person below does what they can with feet on the wall. I skipped two obstacles here. Funky Monkey I knew I did not have the grip strength left for. I had talked myself into King of the Swingers, went to get my flotation vest out of the pack, and found the zippers too solidly mudded to get it open. I wasn’t comfortable with the float in the pack, so I said “next year” and went on. Running on through hay fields, over hay bales, through Rain Man (going through water under a chain-link fence, with a hose pouring on you from above) and we made it to the final obstacle/finish line. I elected not to go the electric shock route, and went for Frequent Flyer’s Club, jumping off a platform, trying to hit the bell with your headband color, and landing on an inflatable below. Sort out your swimming/floating situation. You are going off that platform next year. The Army Reserves were running a fitness challenge at the festival area. I didn’t see it until after I was done and for various reasons didn’t step up for it. If it is there next time, I’m making it a point to do it. Posted on July 25, 2016 by themonkofthemud. Bookmark the permalink.